With a constant battle to draw in guests occurring, theme parks across the world are constantly searching for what will be the next big attraction that will make them stand above the rest. To discover that attraction, sometimes parks take the risk of investing a great deal of money into a ride that has never been done before. The rides that succeed gained an incredible reputation and led to more of their kind to be built throughout the world. An example of this situation Batman: The Ride at Six Flags Great America, the first B&M Inverted coaster of many to come. However, sometimes the risk doesn’t pay off and very few, if any rides of that type, are built. Today we are looking at a coaster that initially had a very promising beginning, but ultimately it was the only one of it’s kind to ever stand. That coaster is the infamous Z-Force. Let’s begin with the basics, Z-Force was a coaster manufactured by Intamin and designed by Walter Bolliger and Claude Mabillard. The ride opened in May 1985 at Six Flags Great America as the first ever Space Diver model - referring to the rapid diving swoops that make up the bulk of the ride. According to a publication by Intamin, the ride stood at a height of 23 meters (75 ft.) and achieved a maximum speed of 80 kmh (49 mph). The track measured 630 meters (2,079 ft.) long, producing a ride that lasted approximately one minute from lift hill to brake run. All of this sounds pretty standard for a coaster, however there were two things that made this ride stand out from the others being built at the time. The first is the footprint, which was very compact as a result of it mostly consisting of very tight dives and climbs. The exact dimensions are stated to be 65 x 18 meters (215 x 60 feet), which is a tiny footprint. For comparison, a standard Vekoma Boomerang requires a footprint of 88 x 30 meters (289 x 98 ft.) and that only has 285 meters (935 ft.) of track. 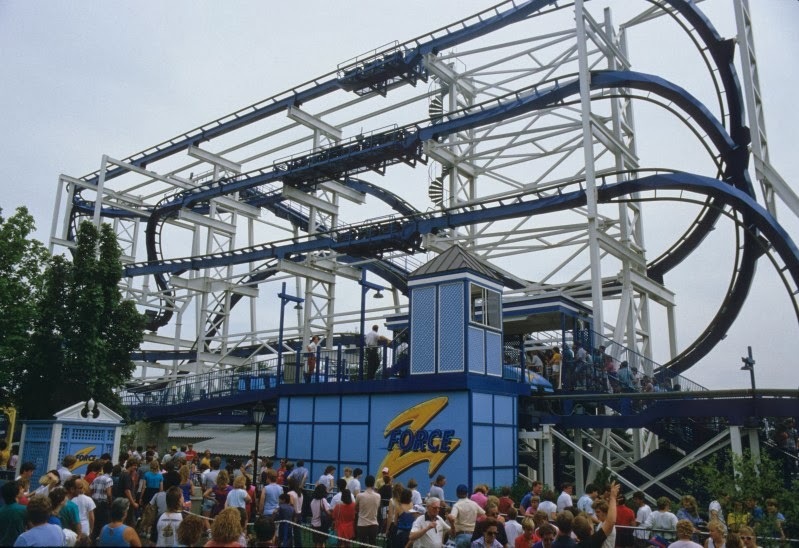 Z-Force was able to squeeze double the amount of track into a footprint that was much smaller, meaning it was perfect for parks that wanted a thrilling attraction in a tight plot of land. The second unique feature of Z-Force was its trains. Z-Force was the first coaster to feature four across seating, allowing for the train length to be reduced while maintaining a good capacity. The Giovanola manufactured trains consisted of five cars allowing for 20 riders per train. Each rider was secured with individual over the shoulder restraints and a lap bar that laid across all four seats. The ride was capable of operating up to three trains, yielding a maximum theoretical capacity of 1,400 guests per hour. A quick glance at the trains and you may think they appear to be something that should be found a B&M. However, a common criticism with these trains were that it was difficult to see what was coming ahead due to the large zero car and seats. Z-Force’s train on the brake run. Now let’s talk about the layout of this thing. Riders begin taking a left hand turn prior to engaging with the lift hill. Once they reach the apex of the structure, the trains take another left and slowly roll forward along a straight piece of track. The track then suddenly ends with an abrupt dive into the structure, leading into an ascent into the next dive. Two dives later and the train is sent into a hill and a sharp twisted ascent. There are then two more dives and the ride finishes off with a tight upward helix before entering the brake run. In between a few of the dives, mid course brake runs are positioned to split the ride into multiple blocks allowing for multiple trains to operate efficiently. Interestingly, the dives that make the ride unique were never classified as inversions. Despite coming close it never truly inverts riders. A modern coaster that faces this classification question is Gale Force at Playland’s Castaway Cove, as everything that looks like it should be an inversion twists in a way that isn’t an inversion. To see this ride in action, hgillooly provides a pov of the ride when it operated at Six Flags Magic Mountain under the name Flashback. Looking at the ride’s stats and it’s unique features, it is crazy to think that only one Space Diver was ever purchased. How could a ride that broke many of the norms coasters followed not catch on with any other park? The reason can be narrowed down to two possible issues. One being reception and the other being the Six Flags Ride Rotation Program. Let’s begin with the former, when Z-Force was at Six Flags Great America, reports say that people did enjoy the ride. Some enthusiasts said the ride was fine, but overall the experience did not receive the fanfare Batman gained few years later. We will comeback to guest satisfaction in a minute, but let’s shift gears to the ride rotation program. To quickly summarise, the program functioned as a way to relocate rides from various six flags parks to others to provide a “new” ride for each park every few years. Z-Force was one of those rides and after just two seasons after it opened. It closed at Six Flags Great America and reopened at Six Flags Over Georgia the following year. The ride remained there from 1988 until 1990 under the same name. 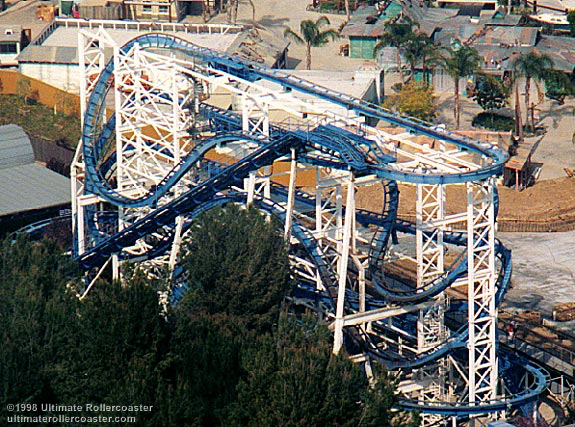 The ride then closed again and was sent to open at Six Flags Magic Mountain on April 25, 1992 under the name Flashback. As a result of the frequent relocations, the ride got rougher throughout the years and guest satisfaction dropped. Many enthusiasts called the ride painful and ridership fell immensely. The time Flashback was at Six Flags Magic Mountain was a strange one, as it operated sporadically over the years. The reason for this was due to its close proximity to the neighboring water park, Hurricane Harbor. Six Flags worried that the noise produced by Flashback would distract lifeguards on duty. Throughout the summer months, the ride sat dormant. It remained this way until 2003 when the ride closed for good. At the time, it was not known whether it would be relocated, or even whether it would ever reopen. After four years of remaining closed, Flashback was removed from the park and scrapped. Flashback at Six Flags Magic Mountain, notice how close it was to Hurricane Harbor. Although reports state that the ride was not the best, the loss of such a unique coaster was a little bittersweet for enthusiasts. However, it is safe to assume that the compact nature of this ride could have served as inspiration for other compact rides. Models such as Premier’s Sky Rocket II and S&S’s El Loco share a similar purpose as Z-Force - to provide a thrilling ride in a small space. Although we never saw another version of the ride, one can’t stop to think if things would have been different if it was built under different circumstances. With how advanced roller coaster technology and design has become, would you like to see a ride with a similar layout to the Space Diver be built? Also, this can’t be a Coaster Bot post if I don’t ask, “What’s your opinion?”.